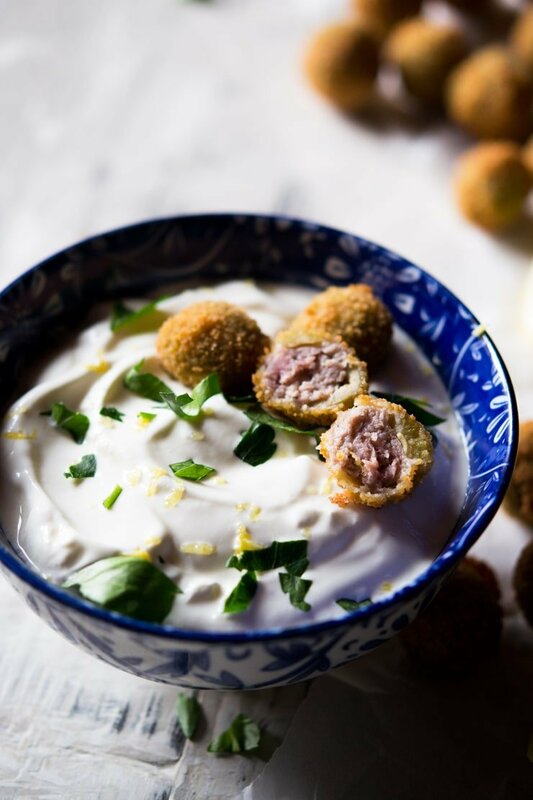 Delicious and crispy sausage stuffed olives, deep fried and served with a squeeze of lemon juice and simple sour cream dip. These stuffed olives make a great appetizer or snack that are perfect for weekend nibbles with drinks or to serve up at your next party. Deep fried stuffed olives are SO popular in Italy. They are served as an aperitif or aperitivo with drinks in many restaurants and bars and let me tell you they are so delicious and highly addictive! They are so popular here that you can buy them frozen in most supermarket so all you need to do is deep fry them as you need them. Although that’s very convenient and all that, I’m not a fan of frozen anything (with the exception of some veggies). I also doubt they are easy to find outside of Italy so buying them pre-made could be difficult. Not to worry, I have the easiest stuffed olives recipe for you here and you’re going to love it PLUS they taste 100% better homemade. Tip: Make a big batch and freeze them for a quick and easy last-minute snack. You can stuff your olives with many different ingredients. I went for Italian sausages which have spices and herbs such as fennel seeds and oregano and garlic. They have so much flavour and are great for this recipe. See more ideas below. Place the breadcrumbs, flour and beaten egg in separate plates/bowls and set aside. Add the sausage to a bowl with lemon zest and oregano and mix together (photo 1). Drain the pitted olives, rinse and pat dry with kitchen paper. Cut one olive in half and stuff with a small amount of sausage then close the olive back up by pressing the sides together. Repeat with all the olives (photo 2). 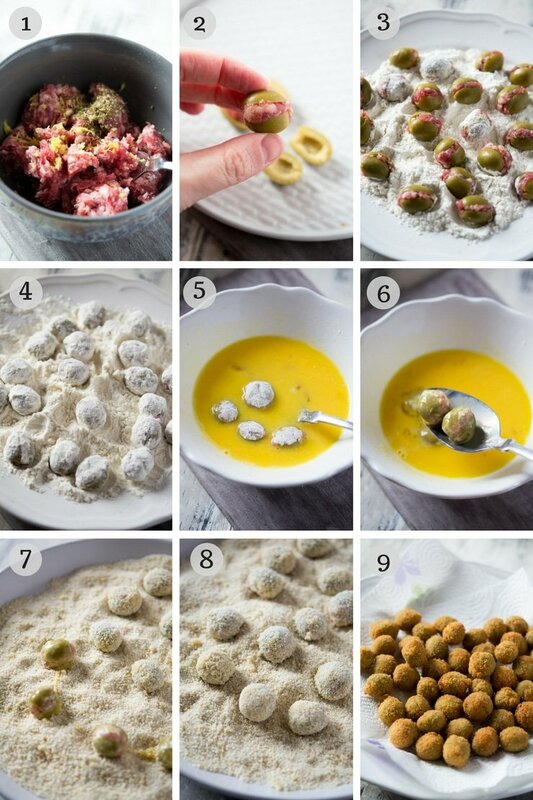 Roll and toss the olives in the flour until coated well. Dip them in egg and then roll in breadcrumbs until completely coated (do this in batches) (photos 3-8). Tip: Cup the olives in your hands after dusting in flour and lightly shake to remove excess flour before dipping in the egg. Tip: Roll the crumbed olives gently in the palm of your hands to create a rounder, more uniformed shape. Deep fry the olives in sunflower oil until crispy and golden brown, remove with a slotted spoon and drain on kitchen paper (photo 9). To make the garlic sour cream dip, combine all ingredients in a bowl and mix. Serve the olives with the dip and wedges of lemon. 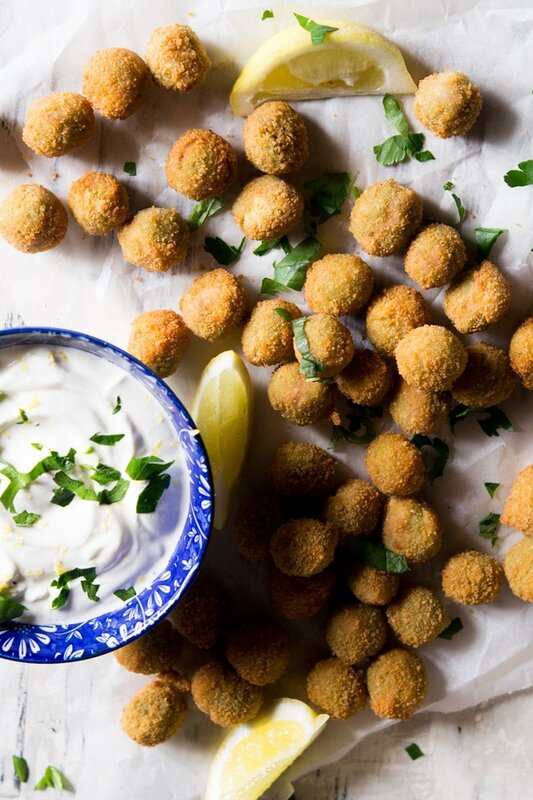 Fried stuffed olives are not usually (or ever) served with a dip or lemon wedges in Italy but I think it goes really well especially at parties. Everyone loves a dip, right? Delicious and crispy sausage stuffed olives, deep fried and served with a squeeze of lemon juice and garlic sour cream dip. These stuffed olives make a great appetizer or snack that are perfect for weekend nibbles with drinks or to serve up at your next party. Add the sausage to a bowl with the lemon zest and oregano, mash with a fork to mix together. Rinse the olives in cold water then dry with a paper towel. Cut the olives in half and stuff with a small amount of sausage meat (around 1/2 tsp) then close the olives back up by pressing the sides together, repeat with all the olives. Place the flour and breadcrumbs in separate plates and a beaten egg in a bowl, season each of them with a tiny pinch of salt and pepper. In batches, toss the stuffed olives in the flour then dip in the beaten egg and then roll them in breadcrumbs, repeat until all the olives are crumbed. Add the sunflower oil in a large pot, test with a small piece of bread to see if the oil is hot enough. When the bread sizzles on the surface and turns golden it's ready. Fry the olives in batches until golden and crispy, remove with a slotted spoon, drain on kitchen paper. Scatter over some chopped parsley and serve with lemon wedges. To make the sour cream dip simply combine all ingredients in a bowl and serve. Cup the olives in your hands after dusting in flour and lightly shake to remove excess flour before dipping in the egg. Roll the crumbed olives gently in the palm of your hands to create a rounder, more uniformed shape. What Stuffing To Use? You can stuff your olives with many different ingredients. I went for Italian sausages which have spices and herbs such as fennel seeds and oregano and garlic. They have so much flavour and are great for this recipe. See more ideas below. Oh these are just perfection. I have fond memories of aperitivo…stuffed olives, charcuterie and a glass of prosecco. I just adored my time in Italy! I will be making these soon. Are they best served hot from the fryer or could I keep them warm in an oven? I actually can’t think of anything better than nibbles and a glass of prosecco, it makes me happy hahaa. Yes, they are definitely at their best straight from the fryer served hot. Thanks, Claire. This is such a great idea! I’ve never seen fried olives before. And it looks so easy to make. I love your step by step instructions, they make it easy to understand the process. Very well done! Thanks so much Maria, they really are so easy definitely give them a go! Now this is a unique and delicious looking appetizer or snack. This would be great for a game night! They would be so great for a game night, thanks so much Allison! I’m sure you’ll love them, thanks so much Stephanie!